← Day 37: Mail a Card to PostSecret. It’s so good to be back in the city… I had almost forgotten just how crazy it can be. It really doesn’t take much digging to find unusual events happening in this town. 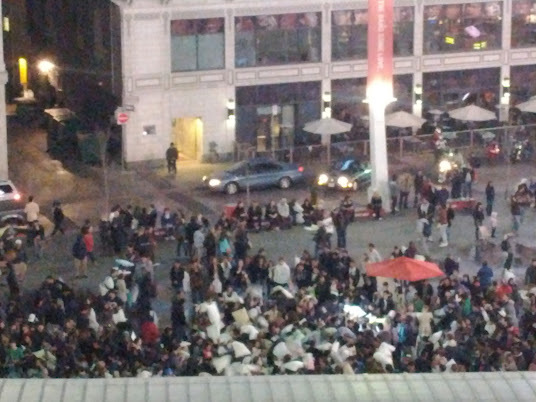 Tonight, there was a massive gathering of my fellow nutbars in Dundas Square (Toronto’s version of Times Square) starting at 8 pm, for, what else, a pillow fight – but not just any pillow fight – this one was the bunny edition, in support of International Pillow Fight Day. Hoppy Easter! 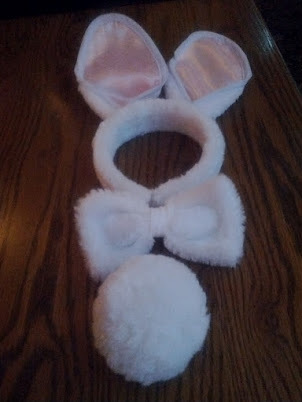 To prepare for it, I had wisely bought the recommended bunny ears as part of a set, complete with a bow tie and tail for all of $2 at Dollarama. Although the package had a picture of a young child on it, and it was next to baskets for collecting eggs, the headband managed to neatly span my gigantic cranium, and the other two pieces were on stretchy elastic bands that attached with velcro. Perfect. After downing our pints of liquid courage, we made it to the square on time, got a good grip on our pillow cases, and, well, started swinging. In a word? Awesome! We were giggling away, hurling our pillows at friendly strangers, and getting our bunny ears periodically knocked clean off our heads. Good times! After about 20 minutes, we had had enough – it’s surprisingly exhausting to keep whirling like that. 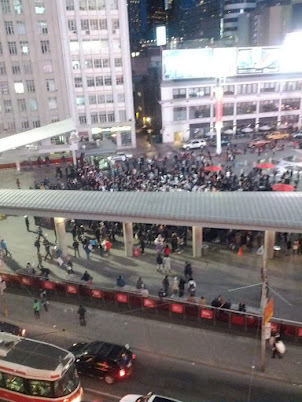 So we crossed the street for a celebratory pint on the patio at Jack Astor’s, where we could continue to oversee the action from a fantastic vantage point. 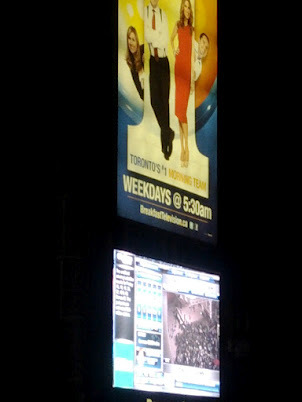 There were a plethora of cameras and a local film crew or two, so the spectacle even made it on the local news and jumbotron overlooking the square. Before I threw in the towel, I offered my pillow to a young lad whose face lit up like a Christmas tree, and whose father then deftly navigated him and his sister into the melee. He was indeed a Happy Boy. The Pillow Fight – Bunny Edition continued for about an hour and a half. There are definitely some swingers out there with serious stamina! Hmm, is it just me, or does that sound dirty? Ah well. You can see more pics from the event here. Needless to say, I don’t think I’ll be trying out for the Pillow Fight League any time soon. The PFL, by the way, does exist, and gives new meaning to fighting like a girl. If you’ve never seen it live, then you really haven’t lived. And with that, I bid you a fabulous long weekend. Remember – there are precious few occasions where chocolate and candy for breakfast are perfectly acceptable. This is one of those times, so enjoy! 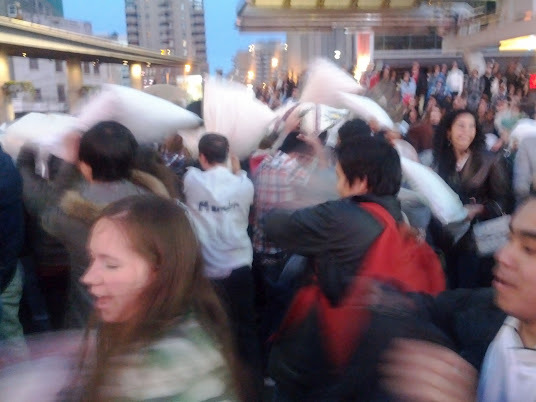 This entry was posted in Fun and Crazy and tagged April, Crazy, Dundas Square, Elephant and Castle, Fun, International Pillow Fight Day, pillow fight, Pillow Fight League, Toronto. Bookmark the permalink.